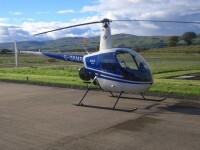 Product review: Helicopter lesson – by Tom Crossan, 12 Mar 15 5/5 Excellent "There were no problems at all arranging the date at the time of booking, and no problems getting there. Contact was made as soon as I arrived; the staff were very friendly and helpful. We sat in the dining area and had a coffee while waiting. The staff were really helpful and answered all the questions put to them. The equipment appeared well maintained, and functioned perfectly well. During the briefing I felt absolutely relaxed and raring to go, had no worries about safety whatsoever. All in all, a brill time, the only downfall was the weather (which was not great), but that did not hamper my enjoyment. " On arrival you will receive a pre-flight briefing detailing basic flight and safety instructions. Now, step out onto the apron and into our Robinson R22 helicopter for the experience of a lifetime. 30 minutes flying time gives you plenty of places to choose to fly over, perhaps you've always wanted to see the fabulous views over Glasgow, or historic Bannockburn and the Wallace Monument. Wherever you choose to fly, you will marvel at the spectacular aerial views on your selected route, the only limitation being the unpredictable Scottish weather. The great value of a trial flight is that you receive one to one instruction from our pilots; fly in a helicopter where you want, when you want and on a day of your choice. Your friends and family can share the experience taking photographs from the comfort of the airport Restaurant. After your flight you will receive a signed certificate as a memento to remind you of this fantastic experience. These flights are available throughout the year 7 days a week from Cumbernauld Airport. Our Robinson R22 helicopter has a weight limit of 240 Lbs per person. There were no problems at all arranging the date at the time of booking, and no problems getting there. Contact was made as soon as I arrived; the staff were very friendly and helpful. We sat in the dining area and had a coffee while waiting. The staff were really helpful and answered all the questions put to them. The equipment appeared well maintained, and functioned perfectly well. During the briefing I felt absolutely relaxed and raring to go, had no worries about safety whatsoever. All in all, a brill time, the only downfall was the weather (which was not great), but that did not hamper my enjoyment.